Nestled in a quiet setting in the woods sits this custom - built, mountain, luxury cabin. Exposed timber, vaulted, ceilings; Hickory, radiant heat, floors; custom, masonry, wood burning, fireplace; and craftsman woodwork throughout combine to create a truly remarkable mountain retreat. In addition to the 2 main level bedrooms, grand master suite, and kitchen/great room, the floor plan offers an open loft family room. An expansive, Sierra Antique, rock patio presents a space to enjoy the serenity of nature while close to the comforts of home. Hot tub enjoys the privacy of adjoining, vacant, conservancy lot. Walk to HOA beach and market. Close to mtn. biking, hiking, boating, and local bistro. Place is a perfect place to enjoy along weekend in Tahoe. It’s quiet and beautiful. Master bedroom is huge and contains a study. The property is very nice and the kitchen is stocked with the proper cooking utensils. The Hot tub cover was frozen shiut, but the property manager fixed it and we used it two nights. Only half of thr jets worked (other pump does not work) but it was great to use with the snow around us. The cabin never got over 65 degrees downstairs and upstairs the thermostat said 63. We had them all set to 68 as the instructions told us to do. The water heater needs help. First day four of us took showers and the last two (myself included) had no hot water. The property manager did say they would fix it in the future. Jenny (property manager i believe) was very responsive to emails and had the dish network changed to have local channels. The bottle of wine when we arrived was a nice touch. We plan on trying this property again when we come back to Tahoe in August. Overall, had a great time with just a few minor problems. Also, pillows in the kids room were better than the upstairs pillows. May need to change them. We just returned from two nights in this beautiful spacious custom home. The home was exactly as described with high vaulted wooden ceilings, a huge master bedroom with extremely comfortable bed, a large family room upstairs complete with a piano and large screen TV. We loved the piano! The kitchen was modern and stocked adequately to allow us to have very comfortable meals at home. The hot tub was another bonus. The home is clean and there is a beautiful sense of peace within this home. It is located close to the water and we were thrilled to be able to just walk out the door, walk a short distance and find a spectacular panoramic view of Lake Tahoe. 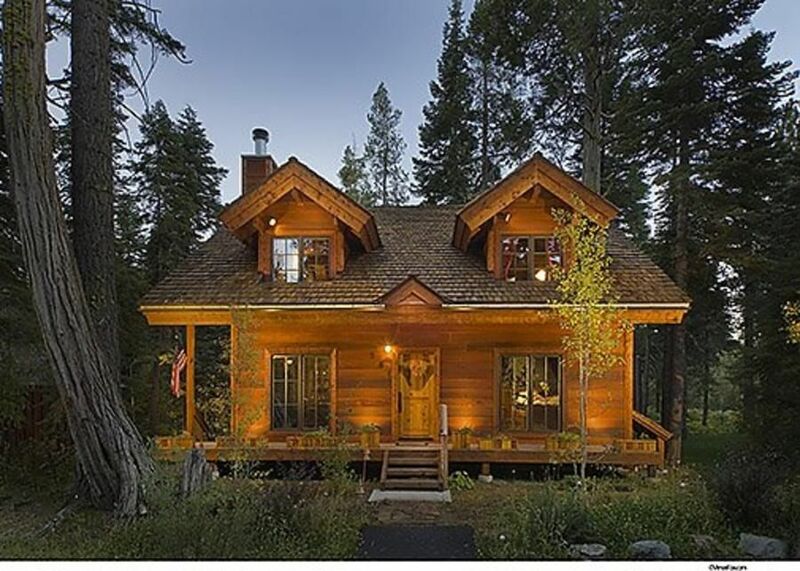 It is located close to Tahoe City and near by wonderful day hikes and activities. This place was absolutely ideal for a long weekend of relaxing and unwinding. The fireplace, the quiet street, the bears outside the windows (yes! Really! We had a visitor!) made for a truly special and peaceful experience. The property is easy to find and in a great quiet area, walking distance to the lake and a few small stores and cafes. Less than 20 minutes drive away is Tahoe City with supermarkets, CVS, restaurants etc should you need anything. We can’t fault the property in any way, but I would make a suggestion to the host that for the price per night, brand new linens are due! Those there were clean but stained - not what I would expect in such a gorgeous property and at such a price point. While we didn’t receive any responses to our messages and phone calls to the host, the instructions we were sent automatically when booking were more than enough to direct us there and give us access when we arrived. We really enjoyed our one-week stay at this home. It had everything we wanted and needed. We only used the master bedroom as there were just two of us. The bed was comfortable. Loved having warm blankets for chilly evenings/nights. We enjoyed several fires in the fireplace, one evening around the outdoor fire pit, use of the hot tub, and use of the gas grill. We cooked several meals and found the kitchen stocked with what we needed. The entire house was clean and well maintained. Appliances all worked well and appeared new. The property is not as secluded as it looks in the photos - there are no neighbors on either side of the house but there are neighbors across the street and behind the house. We weren't bothered in any way by the neighbors and the neighborhood itself was quiet. We would rent this home again! Very enjoyable stay. Great location, nice amenities. Located on Tahoe's pristine West Shore, this mountain cabin offers a convenient location for both summer and winter activities. 5 minute walk to the lake, HOA beach, and pier and local bistro. Close to Homewood Marina, West Shore Cafe, and Homewood Mountain Resort. Mountain biking and hiking trails accessible from nearby Sugar Pine State Park. Please note that rates are subject to change and must be confirmed by owner. Please inquire about varying lengths of stay over holidays. The nightly rate for holidays is $400.00. We generally accept week long bookings for 4th of July, Christmas, and New Years.